We arrived at the Poggioli plant early in the morning and were greeted with hairnets, lab jackets, shoe covers and a tiny cup of espresso shoved into our hands. Let the cheese tour begin. I had the exceptionally good fortune of accompanying our Tasting Tour of Italy winners, Carol and Sue, on a trip to Northern Italy that included an intimate first-hand view of just how they make Italy’s most famous cheese: Parmigiano Reggiano. Also along for the ride was our Vice President of Finance, Deb. The four of us scrambled into our scrubs, downed our coffees and eagerly stepped into the main production room. Forty copper vats were in various stages of cheese production, being worked by a small team of men dressed all in white from their ballcaps to their knee-length rubber boots. It was a mesmerizing sight. Fabiana Ferrarini, whose third-generation family farm provides milk to the plant, walked us through the process while we watched the cheesemakers in awe. Because Parmigiano Reggiano is a Protected Designation of Origin cheese, each step in the centuries-old process is tightly controlled yet relies heavily on cheesemakers’ expertise rather than machines. 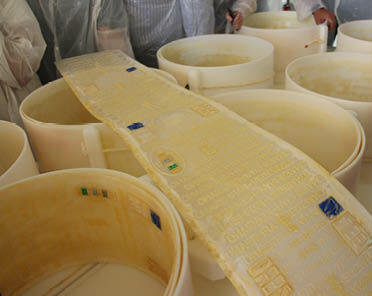 Each batch of Parmigiano Reggiano is made from an evening and a morning milking, Fabiana told us. Milk from the evening is separated overnight and only the skimmed milk is used for cheese. Since the farm is less than eight kilometres from the plant, the morning whole milk arrives still warm and is immediately divided into the vats and mixed with the skim milk from the previous evening. The mixture is warmed up, rennet is added and that’s when the magic begins. As we watched the milk transform into a yogurt-like texture, the cheesemakers aerated it with a gigantic whisk (we’re talking five feet tall) and constantly dipped their hands in the vat to feel the consistency. As the cheese started to firm up they would scoop some curds from the bottom of the vat and hand squeeze them to see how much water came out. 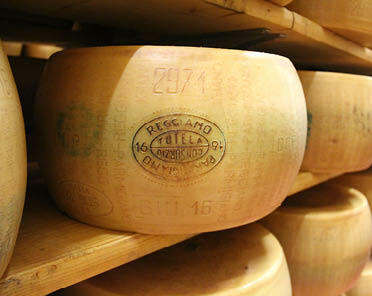 Once satisfied, the cheesemakers corralled the 100 kilograms of cheese in each vat into a large square of muslin, then sliced it in half into what would eventually become two wheels of Parmigiano Reggiano. And that was only the first step! In the next white-walled room we watched more men in white uniforms wash the cheese and place each 50-kilogram ball into a hard plastic mould to begin shaping it. Compressing the cheese with a 10-kilogram disc on top, they turn the mould over every four hours to squeeze out the water. Then the wheels are put into a second, very important mould that will stamp the words Parmigiano Reggiano as well as the cheese identification number, date and approval number into the rind. That, said Fabiano, is how you can tell if you’re buying real, made-in-Italy Parmesan cheese; the rind will always say Parmigiano Reggiano. Walking into the next room we found more cheese wheels in a third, more rigid type of mould, and cheese wheels submerged in a saltwater bath (the only preservative allowed in Parmigiano Reggiano). And then finally there it was; the curing room. Wheels of cheese as far as the eye could see. Neat stacks stretched up to the warehouse ceiling, with each row getting moderately darker as we moved towards the longer-aged cheeses. The smell of 27,000 wheels of Parmigiano Reggiano is hard to describe, but a few words I’d use include glorious, indulgent and deeply satisfying. The four of us sniffed around the room profusely, well aware that we may never get the privilege again. We can, however, eat that cheese any time we’d like and so can you; all the Parmigiano Reggiano in our markets comes directly from Poggioli in Modena, Italy. So grab a chunk or two, maybe with a glass of Tuscan wine or a well-aged balsamic drizzle and have your own taste of Italy. Hairnet not required.